We were listening to a Dean Koontz book on tape that was getting spookier by the minute. 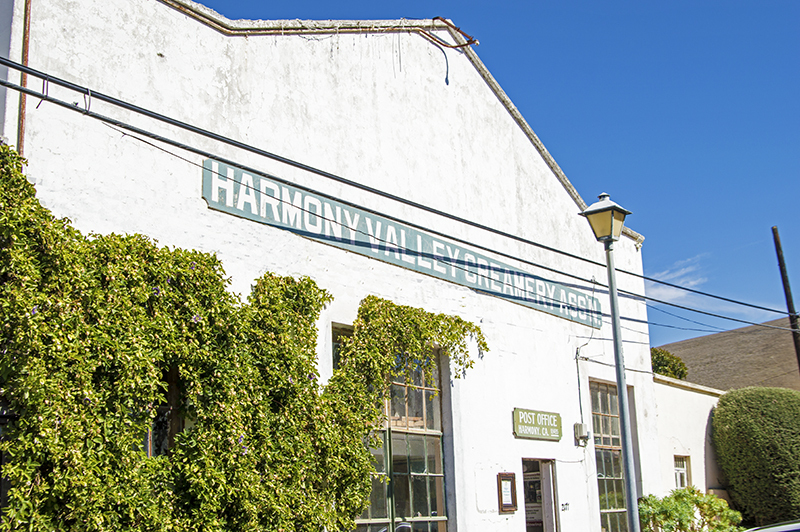 The author spoke of a small tranquil town on the central coast of California called Harmony Center. However, it wasn’t as peaceful as it seemed as you discover while listening to the book. Evidently an alien “being” was taking control of the minds of people in the town and getting them to do all sorts of weird stuff. In some cases he took over the thoughts of people just passing through, but they were able to leave, the few residents couldn’t. In the authors description of the town he depicts it as a short jaunt off of Highway 1 and just a few miles from the coast. This small area had a gas station, a café, cottages, and one evil entity that was making residents slit their own faces or commit murder. As the narrator was reciting the words from the final chapter of this book, we were driving on the central coast of California on Highway 1 near Cambria. Just ahead was a sign for the upcoming city that read …Harmony, Population 18. Whaaaaaat? So we just had to pull over and check out this little town. I have to admit when I got out of the car, the hairs on my neck stood up. I was thinking of that alien that takes over your mind. Where we were, could have easily been that place. This quaint little town was as charming as they get and a lot of it was as he described in the book. Except this town had the feel of art and creativity! I did a quick mind check and thankfully no alien was taking over my thoughts so off I went to explore more. 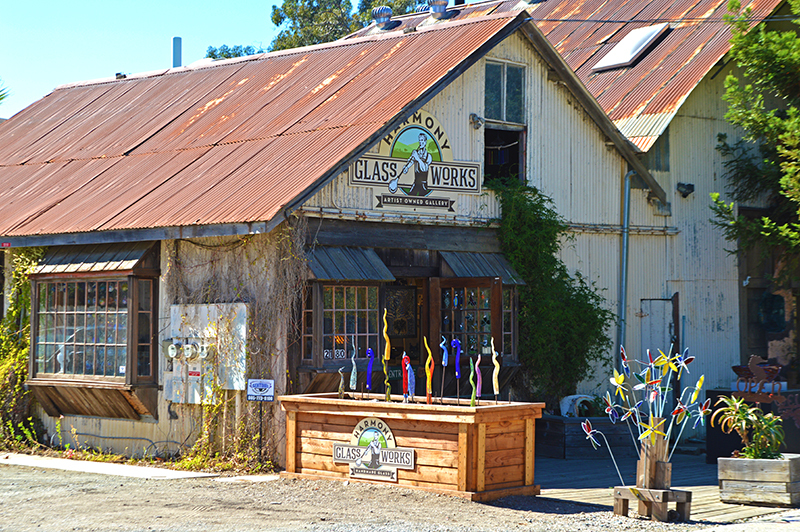 Along with a café, there was a pottery shop and a glass blowing store which gave this town that artisan ambiance. At times they give glass blowing demonstrations but we weren’t’ there long enough to see this for ourselves. There was also a welcome center complete with information and fresh coffee for the weary traveler as well as conversation or sitting areas scattered about. It was a perfect place for a wedding as there was a cute little chapel and nearby there was plenty of space for the reception. Lights were hung to enjoy the celebration through the night and quirky art statues added to the eclectic scene. I would have really liked to stay longer and stroll around the shops but we had to leave. We were on a mission to get to our destination. There is talk of restoring this town to be a must stop for travelers. 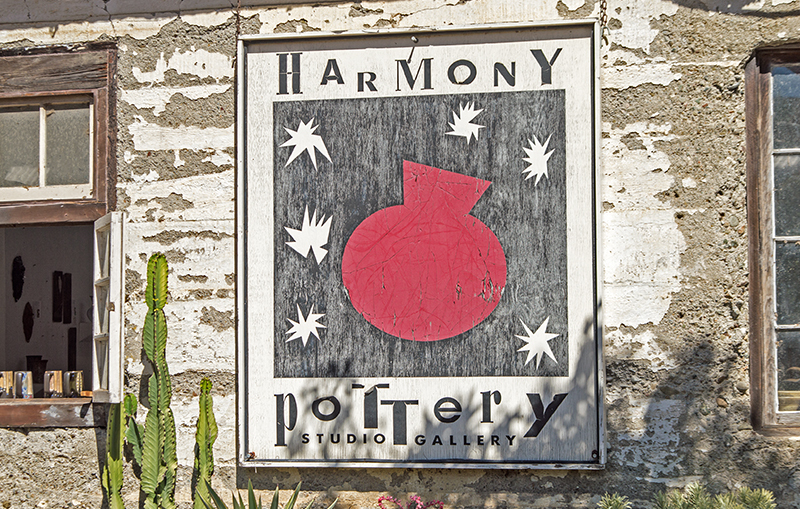 For right now, it is a hidden gem with lots of personality and I am glad we decided to stop and visit. Five minutes later we were back in the car and listening to the last five minutes of that peculiar story. I won’t tell you how it ends but I will tell you when in the central California area, check out the small stopover of Harmony, you will be glad you did.